Here's how it went down in Chicago. It’s been a wild few days for League of Legends fans as Worlds continues. Coming out of the group stages, only half of the teams were left standing. There was no time to rest: they had to fight for their spot in the semifinals and hope that they could prove themselves worthy of a place among the top four teams in competitive League of Legends. The last few days have been jam-packed with games as each quarterfinalist had to fight in a best of five series to progress. I’ve picked the crucial games that defined each series and highlighted the strong points of the winners, the dynamics of each team, and the struggles of the teams who are packing up and heading home. If you’re interested in experiencing these matches for the first time, or you’re watching them again with a keener eye, these are definitely the best games of the quarterfinals. Cloud9 entered the series against Samsung Galaxy as North America’s last hope. 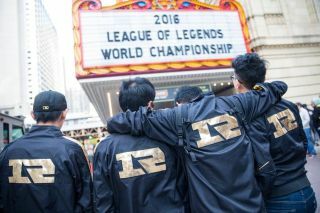 The team had experienced multiple problems throughout their first weeks at Worlds. Victory meant working out those kinks in the system. Samsung Galaxy, by contrast, had been building momentum since their first weeks in the LCK. Samsung were improving throughout the Worlds tournament, and were quite dominant in groups, dropping only one game in group D.
When the teams finally collided in the quarterfinals, Cloud9 crumpled in game one. Game two is the match that best shows Samsung Galaxy’s strengths and coordination compared to Cloud9’s macro game weaknesses. SSG’s mid laner, Crown, was adamant after the game that they respected C9’s strong laners, and this game demonstrated why. Cloud9 were able to maintain a fighting chance until they got caught in the river at baron. Samsung snatched up the chance to win, and things snowballed from there. This is the game to watch because it shows off both sides of the matchup without being a painful stomp like the other two. This series was one of the most exciting of the quarterfinals, with six world champions all sharing the field. SK Telecom T1 is gearing up towards the finals, but RNG was one of their strongest opponents stopping them from getting there. The game to watch from this series? Game one. Game one is such a fantastic game because it shows off Looper’s strength in the top lane. It was genuinely impressive to watch him roll over SKT’s Duke. While SKT fought for every inch of the Rift, RNG took game one. The Chinese fans were hyped. According to Twitter, the Chinese press were cheering in the press room. It was a wonderful thing to see titans bleed. However, SKT ended up taking the next three games as RNG fell apart, unable to live up to their game one form as SKT became deadlier and deadlier. It really was a fantastic first game, though. Edward Gaming entered the game at a disadvantage, with their top laner Mouse having to head home to deal with unfortunate family issues. Koro1 stepped in, and EDG entered the arena against tournament favourites ROX Tigers. The result was a bloodbath in favour of the Tigers. The other Korean teams tend to play in a calculating, slow way that slowly chokes out their opponents. The ROX Tigers are a far more aggressive team, willing to take early advantages and push hard. Game 2 shows off this dominant aggression. Of course, the ROX Tigers had some pretty big advantages going into the game: EDG focused on banning out jungler Peanut, who simply took Lee Sin and picked up kill after kill. Support Gorilla was also on point, seemingly carrying from the bot lane. EDG gave ROX the same strong picks that they had allowed through in game one, and Aurelion Sol and Caitlyn and Zyra proved why they were all playoffs power picks. This is a great game to watch to hype yourself up for the seemingly inevitable ROX appearance in the grand final. The sole European team to make it out of groups faced off against Albus NoX Luma, the Wildcard darlings who had managed to make history by being the first Wildcard team to ever make playoffs. Unfortunately, ANX couldn’t stand up to H2K in a best of five. Each game was a bloodbath, but game one best defines this series. Jankos - the First Blood King - made a huge impact for H2K from the jungle. ANX’s top laner, Smurf, was unable to deal with the pressure from both Jankos and Odoamne. That early momentum snowballed throughout the game, with H2K putting the boot to ANX. It’s important to note that the Wildcard team never, ever gave up. Whether it was stealing baron and taking out the fed Odoamne or trying to initiate a fight with the right combo, they kept their chin up throughout the entire series. Now H2K are moving on, carrying the hopes of both LCS regions on their shoulders. It’s always painful to watch two fan sweetheart teams duke it out, knowing that only one can advance. We can console ourselves with the fact that ANX may be heading home, but they’ve been richly rewarded with the love of League fans and the pride of their region. Now that the quarterfinals are over, we can begin to look to the semis. Making it to the top eight is a genuine accomplishment, especially for teams like H2K and ANX. The quarterfinals are just one step in the journey when it comes to crowning the champions, but teams are starting to show their hands. Picks are shifting, the meta is settling, and the best games are yet to come.